I am running OC v.2.3.02 and I am unable to open Order Totals modules in Extension List in admin. But I can open all other sections (except Order Totals). I get following error - error undefined (see below). Re: Unable to open Order Totals in Extension list in admin panel. Check your error logs in your admin - > systems - > maintenance - > error logs page regarding this event. If none are appearing, check your access logs from your root FTP domain path in access_logs or logs folder or from your host console in the error logs icon. There is one error in error logs, just not sure if is related to the stated problem. "2018-02-14 16:10:12 - PHP Warning: Invalid argument supplied for foreach() in /home/carmirro/public_html/system/storage/modification/system/library/cart/cart.php on line 97"
What is on line 97 of that file? More information is needed. So far, this issue seem to be caused by an installed OCMod extension. 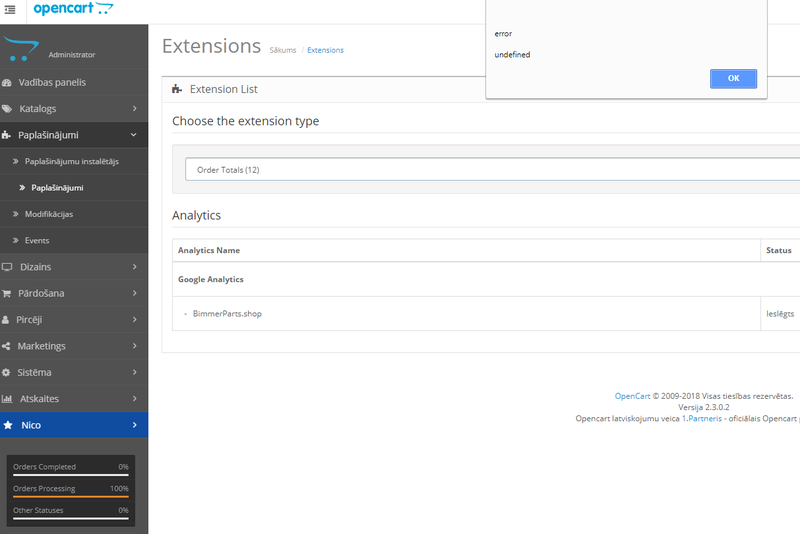 See from your admin - > extensions - > modifications or from your vqmod/xml folder. Ok, will try to switch off extensions one by one and hopefully find the problem. Thanks!